Chapter 1: Introduction, which describes how my silent computing fixation began, back in October 2000. Chapter 2: Underclockers Anonymous, which describes some silent PC design issues and my first efforts to build a fan-free PC. The result was a very successful system configuration based on underclocking a 667MHz Pentium III processor. Chapter 3: Adventures in C3 Land takes up the quest when I try to find out whether a low-power VIA C3 processor can be used to build a system that is both silent and small. The punchline is "a definite maybe" since I was not able to find a suitable commercial case for this project; however I have come to appreciate the aesthetics of the IKEA wooden drawer I used instead. Click here for a photo of my "IKEA computer". Chapter 4: Need for Speed describes what to do when you just can't resist the siren song of a fast Pentium IV any longer. 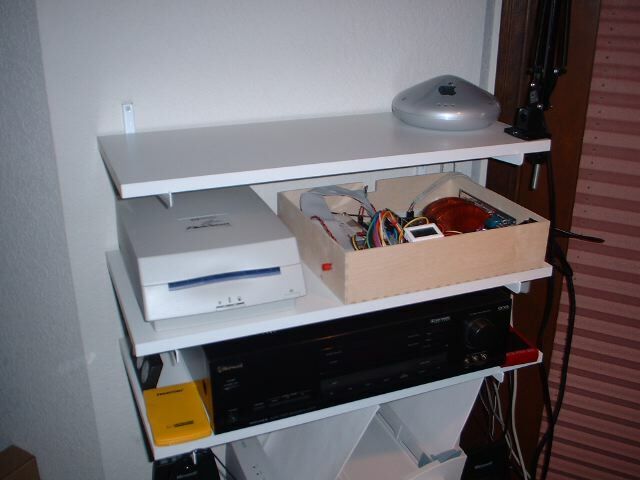 Chapter 5: A Nearly Noiseless Knoppix Server describes a small file/print server solution using my "IKEA" silent computer and Knoppix ("uninstalled" on a Compact Flash card) as the operating system. Chapter 6: Flash Knoppix records the steps needed to run Knoppix off of a CF-IDE (or hard) drive without installing it, a variation on an old idea whose time has come, encouraged by this page. There is also an active Yahoo! "Silent-PC" egroup.